It’s mid-August, do you know where your hurricanes are? Normally we would have had a hurricane by now in the Atlantic Basin. Normally. This year is far from normal. First of all, El Niño is in full swing along a vast stretch of the tropical Pacific. This abnormal warming of both the surface and subsurface waters has created all kinds of weather havoc with more to come. Luckily for those of us in the Atlantic, El Niño is typically a big bully to developing hurricanes. Second up – wind shear and lots of it. Strong upper level winds blowing across the deep tropics, especially coming through the Caribbean, has done its job of keeping fledgling hurricanes from taking flight. This too is a common occurrence during El Niño years. Third culprit – dry, sinking air. A lot is often made of African dust and the Saharan Air Layer but I think it sometimes gets more attention than it deserves. There have been quite a few impressive outbreaks of dry, warm air spewing off the Sahara in recent weeks and months but it is the overall pattern of dry, sinking air that has really put a lid, literally, on tropical development in the Atlantic. Any why not? With all of the warm water in the Pacific, the upward motion has been focused there while the Atlantic, though warmer than perhaps some had expected, is still out of balance and thus the non-rising nature to the atmosphere. This lack of general upward motion has been a serious impediment to development this season. Now enter 96L in to the picture. What about its chances? 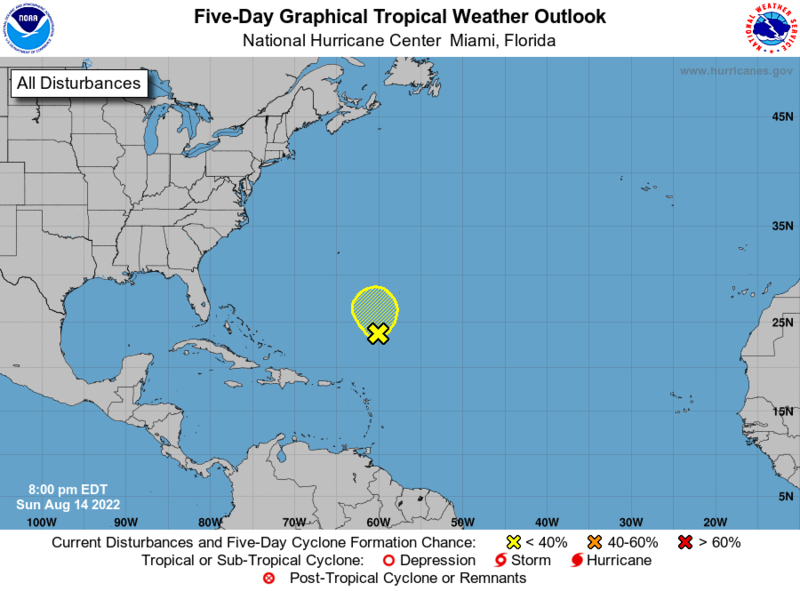 The National Hurricane Center is giving it a high chance of becoming a tropical depression sometime this week. After all, it’s mid-August, water temps are plenty warm and we have a well developed tropical wave and surface low moving across the deep tropics. It seems like it would be all systems go, right? Maybe but probably not – at least not this time. Conditions for development are marginal right now though the water is warm, there’s no doubt about that. But warm water alone is not enough. The environmental conditions needed to produce deep, tropical convection just seems to be lacking once again in the tropical Atlantic. This was predicted very well in advance of the season by models such as the ECMWF seasonal forecast. In other words, it’s no surprise that we’re seeing such little activity. That being said, there is at least a chance that 96L makes it to become a tropical storm over the open Atlantic. If so, its name will be Danny. Some of the intensity models indicate that 96L will become a tropical storm and eventually a hurricane. I just have a hard time seeing this considering the hostile environment ahead of the system. Never the less, we have something to watch now and as August comes to a close in a couple of weeks, we may have even more to watch. For now, the hurricanes have been shut out completely this season in the Atlantic and it looks to remain that way for the time being. We shall see. Check out my video blog which will cover all of these topics and more – I’ll have it posted later this afternoon.